I know the recipe is on Facebook, but experience has taught me it’s not easy to re-find recipes I post there, so here it is, blogged, you know, all proper like. 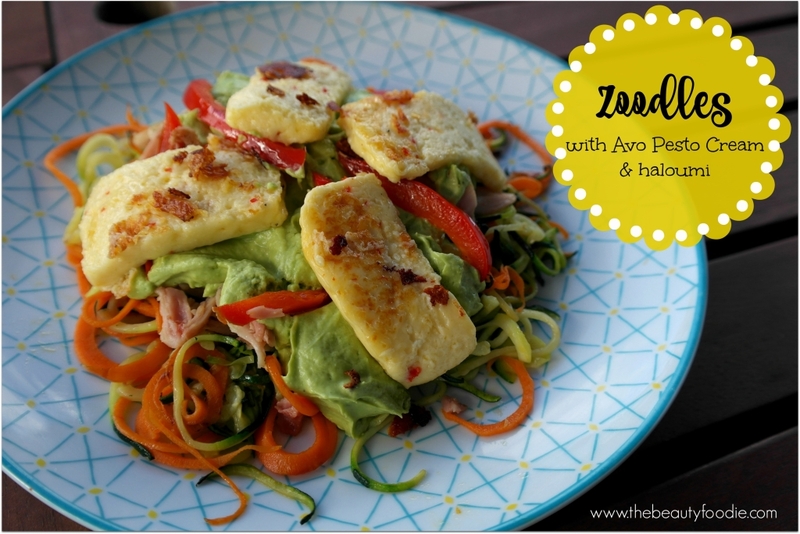 This delicious dish is carb free, sugar free and packed full of good fats stuff like Vitamin C (the zucchini), good fats (avocado) and much more. Optional: 1 cup chopped smoked chicken, or shredded cooked chicken, or diced cooked bacon. Warm your oven to the lowest heat possible - i.e. 50 degrees (this is just to keep the zoodles warm). Place all ingredients in a food processor/blender and blitz until smooth (I used my Nutribullet). Add seasoning to taste. Stir. Set aside. Heat olive oil in a large frying pan. Add zucchini noodles and seasoning to pan. Stir until noodles are tender (3-5 minutes). Transfer to a plate and keep warm in an oven (low heat). In the same frying pan that was used to cook the zoodles, add the sliced capsicum and fry until lightly browned. Set that aside too. Heat 1 1/2 tablespoons olive oil in a frying pan over a medium heat (I used the same frying pan as the one I used to cook the zoodles in, I just wiped it out with some paper towels to clean it first). When the oil is hot, add the slices of haloumi and cook for approx two minutes without stirring, until the bottom of the haloumi is well-browned. Turn the haloumi slices with a fish slice, and brown them on the other sides. Remove from the pan and place on a plate. Set aside. Heat avo and pesto cream for approximately one minute in the microwave (you just want to warm it through, not have it piping hot). Divide zoodles between two large plates. Spoon avo pesto cream over zoodles. Add cooked meat (if using), capsicum and finally, the haloumi slices.